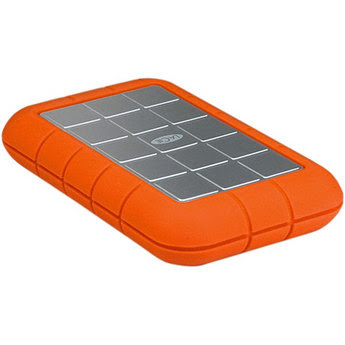 Pics and Kicks: LaCie Rugged Hard Drive. I am IN LOVE with the LaCie 250GB Rugged All-Terrain Portable Hard Drive. Woosh, what a mouth full! Grab yours from B&H for only $96! I travel with this guy to all out of town weddings/portrait sessions and family vacations so I can back up on the go. Max (yes mine has a name) has been dropped, banged up, stepped on, tossled to and fro and a million other external drive no no's and is still going STRONG. Natalie, when you say you are backing up your data to the LaCie, do you mean that you are using it in conjunction with a laptop or netbook? I've been looking at this harddrive as it was recommended by Will Crockett so hearing that you use it as well makes my decision even easier!! Thanks. I LOVE THIS hard drive as well! it makes me feel safe knowing all our stuff is backed up on something so durable and stylish :) ive been following your blog for a good while now and i love your work. good luck with baby #4! I just found your blog today, but about ... a long time ago... I read your DPS posts on going Manual, and even though I was going to school for photography, YOUR article was my epiphany. THANK YOU!!! Also, I am very impressed by you. Four kids?! And you're 28?! I'm 28 and I have a two-year old and I feel so tied down that I think I'll never be the big shot photographer I want to be. HOW do you do it? You put your kids first ALWAYS and everything will work out professionally. Scouts honor! This looks like the perfect way to back up work on the go! And, it is small and easy to carry around. Do you prefer this brand over the Free Agent Go? I've been contemplating getting that one. I thought I was the only one who named my electronics. Awesome. dropped while it is spinning or when it isn't in use? I've never heard of Free Agent Go! ok well now i am going to look into it! how far do you think it fell when it was spinning? not that i plan on dropping it but you never know!